Stripes are pretty easy to do in CSS these days. CSS gradients via the background-image property really got our back. I thought I'd document some variations in one easy to reference place. See the Pen epfEc by Chris Coyier (@chriscoyier) on CodePen. See the Pen xhkpD by Chris Coyier (@chriscoyier) on CodePen. Perhaps a texture? Any image will work. You could reveal part of the image by making some stripes fully transparent and some fully opaque. Or, any combination. Again multiple backgrounds allows this to all happen on the same element. See the Pen gaKyv by Chris Coyier (@chriscoyier) on CodePen. It doesn't have to be exactly 45degrees. That's part of the beauty of the repeating-linear-gradient(). It's not like this perfect rectangle that has to line up and repeat, it's just a set of drawing instructions that repeats. See the Pen qfHmw by Chris Coyier (@chriscoyier) on CodePen. There is a super old syntax for CSS gradients that used -webkit-gradient() (note the no "linear" or "radial"). Basically: Safari 4, Chrome 1-9, iOS 3.2-4.3, Android 2.1-3.0. Old stuff. Those browsers don't support repeating gradients. But you could kinda fake it, especially for straight stripes, by making a small rectangle of background via background-size, drawing the stripes in there, and having it repeat naturally like background-image does. /* The rectangle in which to repeat. See the Pen uxJrf by Chris Coyier (@chriscoyier) on CodePen. If you wanted to get crazy, you could transform: rotate() some element with these straight stripes and cut off the overflow, in which to replicate diagonal stripes with deeper browser support. Sounds like a lot of work. See the Pen oCpEu by Chris Coyier (@chriscoyier) on CodePen. Just to be clear, with repeating-linear-gradient() you are best off doing a -webkit-repeating-linear-gradient() as well as the unprefixed one, if you're, you know, prefixing buy yourself which you shouldn't. See the Pen AEymd by Chris Coyier (@chriscoyier) on CodePen. Sometimes rounding errors (maybe?) or other kinda rendering funkiness happens. Whattyagonnado. I suspect it will get better over time. You can defeat funky town by setting percentage-based stops and using background-size. I don't know if Chrome just calculates to a different precision for % vs px, but I found this got me beautifully neat lines. Another quick tip; sometimes you need to specify background-attachment: fixed or it ignores background-position. This is useful when styling progress bars, etc., with overlapping gradient-filled boxes. See the Pen Repeating gradients by Christopher Cohen (@Jeevecore) on CodePen. This is getting old, but there is still this article by Eric Meyer (May 2012) about the hell that are repeating-linear-gradients: http://meyerweb.com/eric/thoughts/2012/05/30/repeating-linear-madness/. About the first image. The angle shown there is not the gradient angle (the angle appearing in the gradient function), though in this case (45deg) it happens to be equal to it (because 90 – 45 = 45). With the current standard syntax, the gradient angle is the angle between the vertical axis and the gradient line (the line giving the direction of the gradient). I think this pen explains it it better than my words can (click dots to select a new gradient angle and the value in the codebox at the bottom should also change). About jagged edges when having sharp transitions between two colours (either with a random angle for linear gradients or with radial gradients). IE seems to behave best here, especially when it comes to radial gradients, with linear ones the edges aren’t that smooth, though they still look better than in other browsers. One thing that has always worked in IE and Firefox for me, and sometimes also in Chrome, has been to leave 1 to 3px in between. Pen (edges look nice and smooth in IE and Firefox, but Chrome gets really weird). Sure, easy to do…unless you want to support IE9 or earlier. And while Windows XP support will be ending shortly (so theoretically we’ll be able to ignore IE8), Vista support continues until 2017, and Vista can’t install IE10. So IE9 support will probably be a good idea for awhile longer. Simple And superb are css patterns, But it is a old trick we can do more with stripes? This is great. I like the idea of repeating-linear-gradient, but it never seems to render nicely for me (or inconsistently). Maybe I’m just a bit to OCD on this, but the variation in stripe width bugs me plus the random jaggies it produces. It’s pretty minor and I’m sure most people don’t notice or care, but has anyone found a solution for this or a common browser/OS combo that renders better. I create them using just a linear gradient. Seems to render better. Maybe it’ll be better in future browser releases. I’m on a Mac Chrome 33. That definitely sounds like crazy & a lot of work. Get out your calculator (or maybe your CSS preprocessor can do the calculations for you), and figure out the vertical and horizontal distance between stripes of the same colour and use that for your background size. http://codepen.io/AmeliaBR/pen/cBlAI?editors=110 for examples and trig diagram. The only extra complication, is that you have to repeat your stripes a few times to fill up the rest of the rectangle. 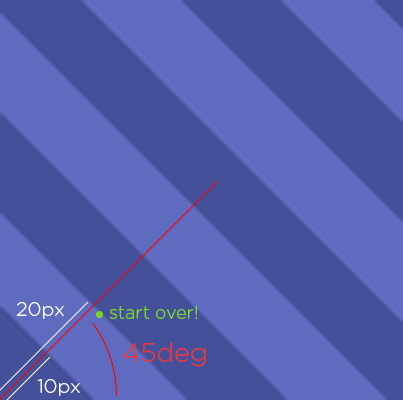 This is a great article, repeating linear gradients (esp diagonals) are a blummin’ nightmare! Thanks for sharing this Chris! I think this book will help a lot about CSS.